A team of international scientists from Norway, Scotland and Ireland reviewed all available published studies on the effects of sea lice and have now concluded that sea lice have negatively impacted wild sea trout stocks in salmon farming areas in Ireland, Scotland and Norway. Previously research was based on individually published studies but this review reached its conclusions based on comprehensive studies of the effects of salmon lice from over 300 scientific publications. The project was funded by the Norwegian Seafood Research Fund which provides investment in Norwegian seafood industry-based R&D with the objective of creating added value for the seafood industry. The studies reviewed indicate that salmon farming increases the abundance of lice in marine habitats and that sea lice in intensively farmed areas have negatively impacted wild sea trout populations. The effects of sea lice on sea trout are increased marine mortality and reduced marine growth. The Celtic Sea Trout Project (CSTP) is an INTERREG IVA Ireland Wales Programme collaborative project looking into the status, distribution, genetics and ecology of sea trout around the Irish Sea which is just being completed. The main aims are to understand and describe sea trout stocks in the Irish Sea in order to enhance sea trout fisheries and strengthen their contributions to quality of life, to rural economies and to national biodiversity, and to explore the use of sea trout life history variation as a tool to detect and understand the effects of climate change. 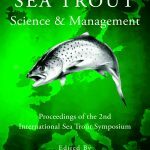 The 1st International Sea Trout Symposium (2004), which identified particular gaps in sea trout research, was a major driver for the CSTP. Much effort during the CSTP was focussed on increasing awareness of the intrinsic value of sea trout and the sampling effort necessitated significant involvement by anglers which helped to further this key project objective. The AARC project partnership has cooperated intensively to deliver a strategy for Integrated Water Resource Management (IWRM), which has been demonstrated across the Atlantic Area, in targeted river basins, networked by regional/river observatories in each Member State. A central focus of this work has been the culturally and economically important migratory fish species that link the different waters of the Atlantic Area – particularly trout and shad. In the marine, coastal and freshwater environments, these species have been managed separately, and now the AARC project has created the tools to enable us to integrate their management. ‘Free fish migration from sea to source’ was the aim of this recently completed collaboration between seven countries around the North Sea region. Once known for its rich fish population the North Sea is now suffering from intensive fish practices and rivers connected with the North Sea are blocked with man-made barriers. The Living North Sea project, part funded by INTERREG IVB North Sea Region, focussed on key issues and solutions for fish migration. The team consisted of fifteen partners working on reconnecting the rivers and deltas around the North Sea region. The project was partly funded by the European Interreg North Sea program. creating greater public awareness about the Living North Sea and its aims and future achievements. The 2012 Carlingford Workshop on Small Streams, which was jointly organised by IBIS and the Atlantic Salmon Trust, explored the importance of small streams for salmonids. It originated in a recommendation made by the AST Sea Trout Workshop that more attention should be given to the significance of small streams for sea trout production; while the focus was on trout, both resident and migratory, the role of small streams in the production of salmon was also covered. The workshop was attended by a large cross section of interest groups including fishery managers, fishery scientists, fisheries trusts, angling groups and environmentalists. It is intended that the outcomes of the workshop will feed into the further workshop being organised by the Institute of Fisheries Management on behalf of the Environment Agency, which will consider the importance of small streams for all species of fish. The objectives of the 2011 Sea Trout Workshop in North Wales, which was organised by the Atlantic Salmon Trust with financial support from the Environment Agency, were to consider what progress had been made in sea trout (Salmo trutta) research since the 2004 Sea Trout Symposium in Cardiff and to identify continuing gaps in our knowledge. The Workshop concentrated on what managers and regulators need to know to manage sea trout stocks and on the research needed to meet their requirements.